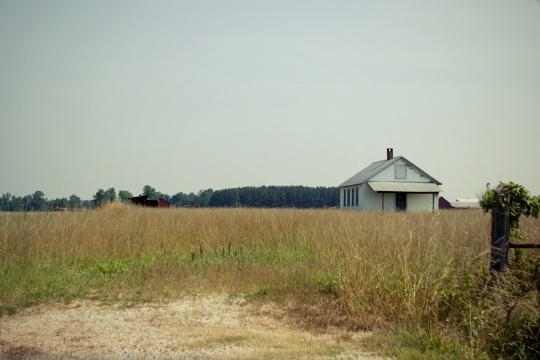 The Deep South has seen only sporadic Amish settlement. Today, a single Amish community is found in Pontotoc County, Mississippi, near the town of Randolph. The Randolph group is the only existing Amish settlement in Mississippi, and in the entire Deep South region. 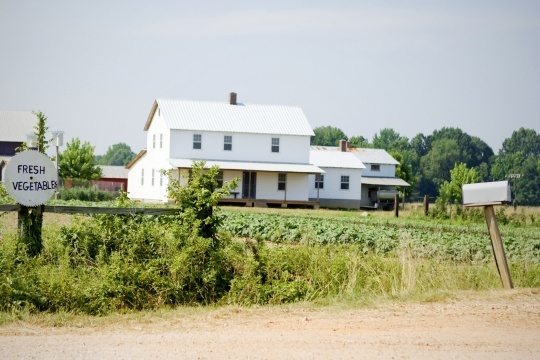 The Randolph Amish settlement, in Pontotoc County in northeastern Mississippi, was founded in 1995 mainly by settlers from the Ethridge, Tennessee Amish community. The Randolph settlement is a very conservative Swartzentruber Amish affiliation. Swartzentruber Amish are noted for their restricted use of technology, lack of SMV triangle emblems on buggies, and particularly plain lifestyle. As is common for Swartzentruber Amish, those in the Randolph community permit only metal rims on buggies, and do not allow propane or gas lights. The Randolph community is a single church district in size. A recent report by a local scribe to the Sugarcreek Budget newspaper estimated around two-dozen households in this community. In addition to the Ethridge settlement, the Randolph community also has ties to a Kentucky Amish settlement. A spin-off settlement of the Randolph community was recently founded in Tennessee. Amish in the Randolph community make a living in a variety of ways. 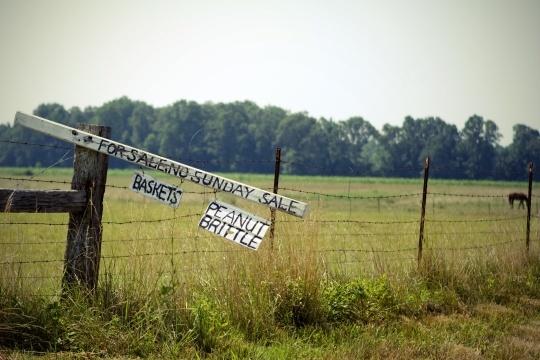 As the only Amish community in the region, the Amish here receive a fair share of non-Amish visitors and tourist traffic, as evidenced by the plentiful signs advertising home businesses throughout the community. 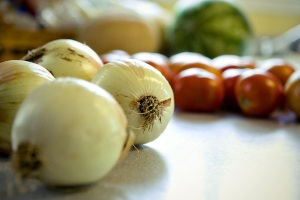 Some operate furniture companies or other small enterprises, such as produce and food sales. Foods common in this community include cheese, butter, boiled peanuts, jellies, jams, baked goods, and sorghum molasses. Handicrafts such as rugs, candles, handmade baskets, and leather goods are also common. Other Amish farm or work in local non-Amish lumber mills, or operate their own mills. Of all the states of the Deep South, Amish have most frequently settled in Mississippi. A number of settlements existed in Mississippi in the first half of the 20th century. As David Luthy describes in The Amish in America: Settlements that Failed 1840-1960, Mississippi’s first Amish community was actually founded in 1896, not far from today’s Pontotoc County settlement, in nearby Monroe County, near the town of Gibson. Amish who founded this settlement came from states including Indiana, Illinois, Kansas, and Virginia. Amish in this former plantation region first began with typical northern crops such as oats, but soon learned to farm cotton. 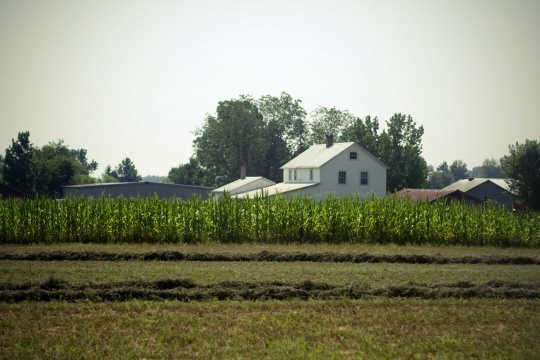 In addition to farming, a few small enterprises were founded in this community, which arose to serve both the needs of the Amish community and their non-Amish neighbors. These included Amish-run well-drilling and brick and tile-making companies. An alternating wet and dry climate challenged the Amish settlers, and the often-thick Mississippi mud made travel difficult at times, with “roads which were so muddy it was almost impossible to use them” (Luthy p. 222). Despite the generally warm and sunny climate, settlers were also hard struck by disease, including typhoid fever and malaria. The community suffered 15 deaths over 8 years, including numerous young girls and pregnant women. Additionally, the sharecropper system remained in place in this part of the South, and Amish found it difficult to work within the system. Since Amish do not sue in court, Luthy explains that this left them exposed to being taken advantage of by their tenants. The Amish certainly must have seemed exotic to the local population, most of whom were black farmers. Of the locals, one Amishman wrote that, regarding cursing, “it seems in that respect the colored race is not as bad as our own; they strictly observe the Sabbath day; no ball playing or worldly amusements are seen amongst them on Sunday.” (Luthy p. 227). Eventually due to challenges caused by the sharecropping system and the unhealthy climate, Amish began to move away. The daughter of one of the settlers recalled leaving the community: “This was a real sad disturbance to most of us. The black people seemed to hate to have us leave, and we had many sad partings. Among us many tears were shed.” (Luthy p. 228). The last Amish family left Monroe County in 1907. Later settlement by Amish concentrated in the extreme southern end of the state near the Gulf Coast. Four more Amish settlements arose in the 1920s and 30s. A small community, never larger than a few families, existed near the town of Wiggins in Stone County from 1928-1932. The area of Kiln in Hancock County was home to 2 separate settlements in the 1930s. One community was founded primarily by Amish from Indiana, attracted to the area by a local land agent. This community was also short-lived, lasting from 1929-1936. Amish in this settlement farmed cheaply-acquired former pine-logging land, and raised a wide range of crops, including strawberries, sweet potatoes, cabbage, peanuts, oranges, and watermelons. They also survived on the abundant seafood available in the local waters, including fish, shrimp, and oysters. Not far from this community there also existed a “Nebraska Amish” settlement, originating from the Big Valley region of Mifflin County, Pennsylvania. Little is known of this settlement. Finally, the longest-lived settlement to date in Mississippi was found near Lumberton, Mississippi in Lamar County, also in the Gulf Coast region. This very conservative community consisted of settlers from Ohio, Buchanan County, Iowa, as well as at least one household from the Moyock, North Carolina Amish settlement. The Lumberton settlement existed from 1929-1948 (see David Luthy, The Amish in America: Settlements that Failed 1840-1960, pp. 220-238). No other Amish settlements besides the Randolph, Mississippi community are found in the Deep South today. In addition to the extinct Mississippi settlements mentioned above, a few communities have been founded in other states in the region. These include settlements in Georgia and Alabama in the early decades of the 20th century. In more recent decades, an Amish community existed in Georgia, but has since disbanded (see Young Center, “Amish Population Trends 1991-2010”). For whatever reason, perhaps because of climate or simply due to historical patterns, the Deep South has not attracted much Amish settlement. 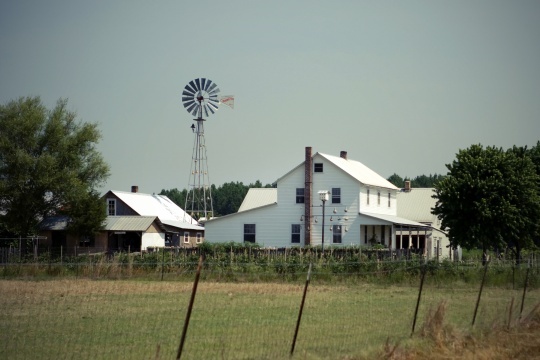 Thus, the small settlement in Pontotoc County remains the sole Amish presence in the region. Our church is planning a small group trip to the Amish community in Pontotoc, MS near the end of May. Are there any hotels nearby? It would be best for you to stay in tupelo- decent dining choices, good hotels and only about 25-30 minutes away. There is one small hotel in pontotoc and one in Houston. But if you get a hotel in tupelo near flea market area you will not be far from pontotoc. Thanks for the info, Christen. From Hilton to the Super 8. Hilton is in historic downtown Tupelo near the Elvis Presley Museum añd other elvis landmarks. BestWestern is by the mall and in a central location of commercial Tupelo. Using hwy 6 to pontotoc takes 15 to 20 minutes ànd id suggest vissiting the Buffalo Park as you leave Tupelo. The Walmart in Pontotoc has a place to tye up horse buggiea. Very interesting culture. Yes ma’am. There are hotels about 10 – 15 miles from the settlement. Will Amish Country in Pontotoc MS be open on May 26 2014? Carolyn if you mean the local Amish businesses, probably so as the Amish do not generally take off for Memorial Day. That may vary by settlement and employer but in this traditional settlement I’d expect that to be the case (though maybe someone local can confirm). Cart Barn in is located in Bruce, Ms. This would give someone about a 30 min drive to the Amish Community. Reasonable priced, quaint, home owned, tranquil area. I want to take a group of 15-20 high school students on a field trip to the Amish Community as part of a larger project exposing them to different ways of living. Is this an appropriate and acceptable practice? I am an authorized distributor of Amish goods working out of Pontotoc. I work closely with a large number of our Community and would be glad to help any groups coming into the area and showing them around. Looking to buy some chairs for my table do the Amish sell any furniture? I purchased a farmhouse table with 4 chairs and bench from Herman Zook. Love it. I am wanting to arrange a date to visit the Amish Community very soon. It would be a group of 14 including our instructor. We are a Master’s level program from the University of Southern Mississippi. Please let me know if this would be possible so I can relay the message back to my instructor. I look forward to hearing from you! I tried to find he Randolph community in September – a guy at a country store told me to follow the dirt road etc. Never saw it. Where can I find a map? Would really love to go there. Feel free to email me!! Thanks a million in advance!! Can you tell me how to get to this community from Memphis. We will be there in March and would love to find this community. Thanks. Google Randolph, Ms. Soloman Road. That is the community that most of the houses are on. 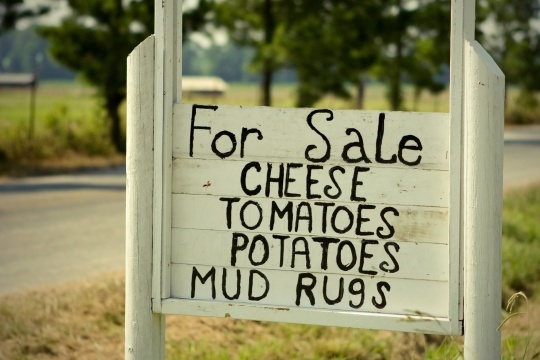 It is about 10 miles from Pontotoc, Ms. I would travel 78 to New Albany, then 15 to Pontotoc, then hwy 9 south to Randolph. At Randolph, turn, left the cotton gin. That road will intersect with Soloman Road. There are houses all along the road from the cotton gin, then take a right.More houses thru there. No Sunday sales. When do they start sale fruit and jam and where best place to go. Our local Amish Community does make furniture. I am a transporter for some of the families. I would be honored to connect you to them. Just email me and I will deliver your information to them and get you a mailing address for the service products you need. I heard a while back that there are Amish in Mississippi that do wonderful horse driving training. I don’t know how to reach them to ask. I read on your post that you could possibly connect me to the right place/family? Any information would be greatly appreciated. I am building a new house in NW MS and would like to price Amish built cabinets. Do the Amish in New Albany build cabinets? I am currently working on helping my mother in law purchase a shed from the Amish Community in Randolph. We live right at 100 miles away. Wanting to see if you can, or know someone that would transport it for us. Any help from anyone would be greatly appreciated. I bought a wooden curved back rocker there years ago. Are those still available to buy on site? Was there recently and there are two houses that sell wooden furniture there in the community. My daughter just had them make her a glider. I believe the name was Zook and he does good work. There is also a Mr. Miller whose furniture also looks good. They all seem to be nice hardworking people. We enjoyed our visits once we found them! Any idea of the price of a curved back rocker? I have quite a few cedar trees on my land that I want to get rid of. Is anyone interested in coming to cut and haul them off. There is also oak and pine and hickory. we were wanting to go uo there tomorrow was wondering if tgey will be saling being Easter weekend?? we were wanting to go uo there tomorrow was wondering if they will be saling being Easter weekend?? I took a recent trip in May to visit the Amish community, taking the time to visit a bit while shopping to get to know them. I had a great time hanging out in the shop and having basic conversation. i was so intrigued by the workmanship that i placed an order for a couple of peices of yard furniture and scheduled a return trip there just this past weekend. Great bunch of folk there. I am planning a visit for this weekend but I don’t see directions to the settlement. What is the easiest route to take from the Jackson-Metro area? I was thinking of taking the Natchez Trace. I have a saddle that the finder leather dry rotted . It is a ruff out finder and it is the piece that has your stirrup holes in it.Can I mail it to someone around that area to fix it and mail it back when done ? I feel it will need a new set of finders they are ruff out. please e-mail me about who i could mail a broken saddle to . I need finder fixed maybe new ones made. Please e-email me the information. thank you..
Was in Ponotoc area in September and could not find any reliable directions to Amish community. Can anyone refer me to a map? Would really like to visit but couldn’t believe the best direction was go down a dirt road and any of the side dirt roads led to farms! Help and thanks. Put Salmon Road, Randolph, MS 38864 into your GPS and it should get you there. thanks much. I appreciate the info. The gentleman in the ad was from the Amish community or worked with them not sure . I came across this site looking for information on who it may have been and was hoping someone would beable to help me get in touch with a trainer for a horse . I have been once or twice a year since at least 2013 if not earlier. I try to take someone new along, someone I know will be interested & respectful. So far at least 4 people, family members for the most part and a couple of friends. When I plan to return at least one of them will jump at the chance to join. I took my grown daughter once and after looking over the furniture and returning to the car, I asked “so what did you think of the bee hives on the porch?”, she didn’t know what I was talking about! I said “go back”, the man must have heard us because he was laughing as we returned to the porch & began to show her the broken down hives and how they work & explained how he collects the honey. She didn’t want to go back as she was embarrassed but was thankful she did as she learned something new and was impressed with his skills! I did ask a man who grew corn a couple years ago if his corn was GMO and he said that he did not know. That made me rather sad. Not sure if he even knows what GMO is.? Where about was the honey bee farmer? 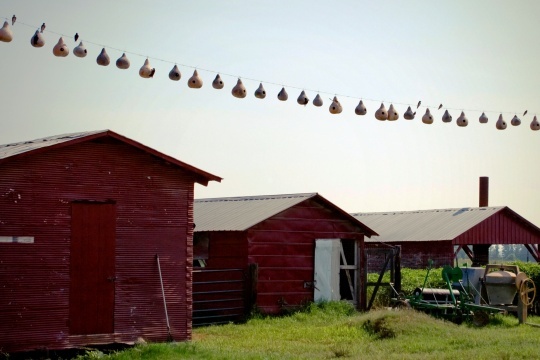 This is something I’m highly interested in is seeing how they farm the honey. It’s not just drive to the corner to find a gas station and she was in need of a restroom all of a sudden. I asked the lady we had just purchased a few items from if she might have a restroom the child could use. She said “yes, but she won’t be accustomed to it”. I said “if you don’t mind, I am sure she would prefer that to what will happen if she doesn’t use it”! She led us to a small room in what I would call a wood storage just outside the house. In that room was another room. Open the door and a bench with 3 toilet lids, 2 large and in the middle a smaller one with a block to step up to. I’d say a septic tank under. Granddaughter looked at the bench like “huh”? But in desperation she climbed the block and sat on the smaller middle seat. I looked for the toilet paper and only saw a phone book. They rip pages for that use! I now do that myself, but just for #1, why not save money & recycle? I put it in trash, not down the toilet. A jar was next to the phone book. I believe it was baking soda, for sanitizing the hands, as there was no sink or water. I would love to spend a day or a week or maybe even a lifetime with an Amish family. But I am “ English” and might not make it after these years of luxury? Yet I am Amish at ❤️ heart. I know how to get to Pontotoc but not how to get to your community. Could you give me an address as a starting point to get there with my GPS? I am only familiar with hwy 15 coming from New Albany. Thank you! Looking to get the word out…I grew up on a farm outside of Bremen, IN, with multiple Amish neighbors, especially Eastward toward Nappanee. In the 90s, a job move took me to the Jackson, MS, area where I found 41 acres of excellent, well-drained, silty loam soil 1 mile from Bentonia, MS.
Long story short: time to downsize, keeping ~10 acres, surveyed rest into 5-6.29 acre tracts (one 5 acre tract was ~1 mile away, 2 tracts have sold) and would love to see an Amish community start up here around Bentonia. Here are two maps (This comment tool has no image submission feature, so I will describe the maps instead. ): one shows all 43 tracts (#25 and #34 are the two currently with For Sale signs and #4 may also be for sale) and the other is the survey showing my four unsold tracts in #42. I have the names and addresses of the 43 landowners (public records obtained at the Yazoo County courthouse) but have no interest in any of the other 43 tracts. I am only selling the purple, red, blue and orange parcels on the close-up survey.